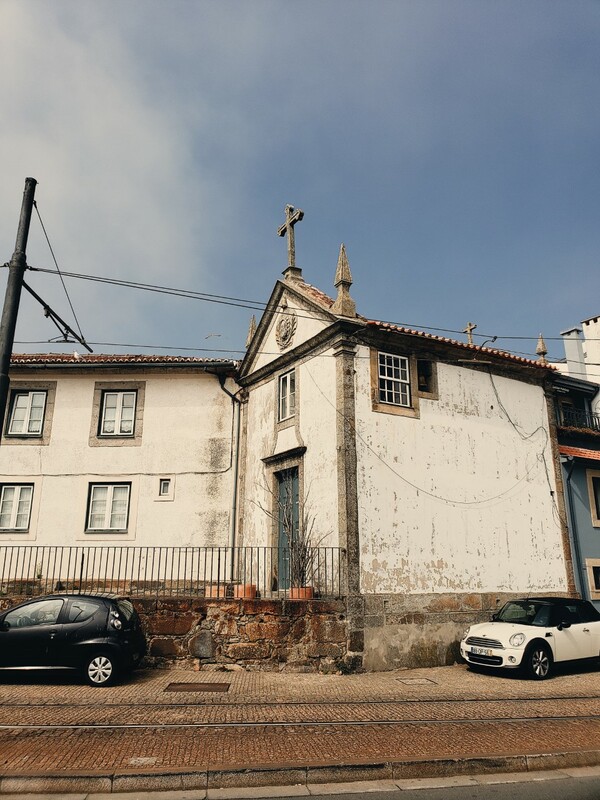 Our first stop in visit to Portugal was the small city of Porto for three nights. It is always highly rated on various travel sites so we were excited to see if it would live up to the hype. Luckily, there is a direct flight from New York City (Newark Airport) two days a week via TAP Portugal. Prices were very expensive when we booked as Europe in the summer is obviously its high season. Normally it is better to book well in advance to secure the best possible price. TAP Portugal was quite comfortable despite being a 6 hour economy flight. If you are traveling as a pair, try to book the two seats next to the window (otherwise, the middle row is four seats together). We arrived in Porto at 8am in the morning Porto time, which is 3am New York time. So, our sleep schedule was about to be shaken up. 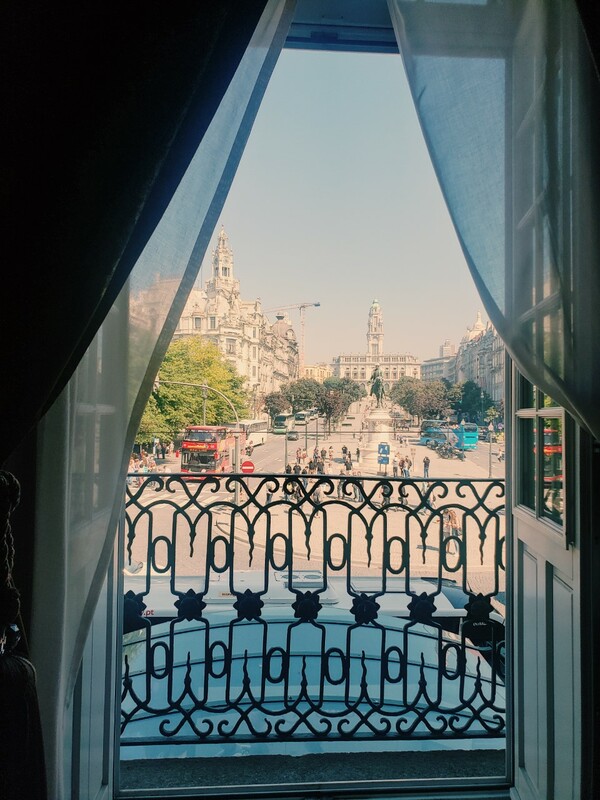 We chose to stay at the Intercontinental Porto-Palacio Das Cardosas, which was in the center of town, a great location! The hotel was nice enough to allow us to check in early around 10:30am even though the regular check in time was 3pm. The hotel was excellent and we had a great room with a Juliet balcony overlooking the town square. Our first meal was a recommendation from the hotel’s concierge, a great tapas place called, Tapas de Boca. We had the Salted Cod Fish, which was amazing! Porto has a lot of nice restaurants but this was the best in our opinion. One also must try the Francesinha, which means “Little French Girl.” It mound of bread, meat, eggs, and sauce that will certainly destroy any diet! While it Porto, one must visit the Riberia area. We were fortunate that this was just steps away from our hotel. It is the riverfront area that is simply breathtaking! The weather was perfect so that certainly helped. There are so many cafes, bars, and restaurants to pop into whenever the urge should strike you. The main attraction for most is the DOM LUIS. You will see kids jumping off the lower part of the bridge for some added entertainment. Along the boardwalk people are enjoying the scenery, jumping in the water to swim, or playing music to entertain the crowd (and to make some money). One day we took the old tram to the beach area but the sky was very foggy there and it was not so warm. With the clouds and the increased breeze, it was on the more chilly side. So, I am not sure if I would recommend the beach there as there are better beaches elsewhere but perhaps on a better day the weather conditions would have made it worthwhile. We then headed back to the main part of the city where the sun was shinning bright and the sky was crystal clear… perfect! 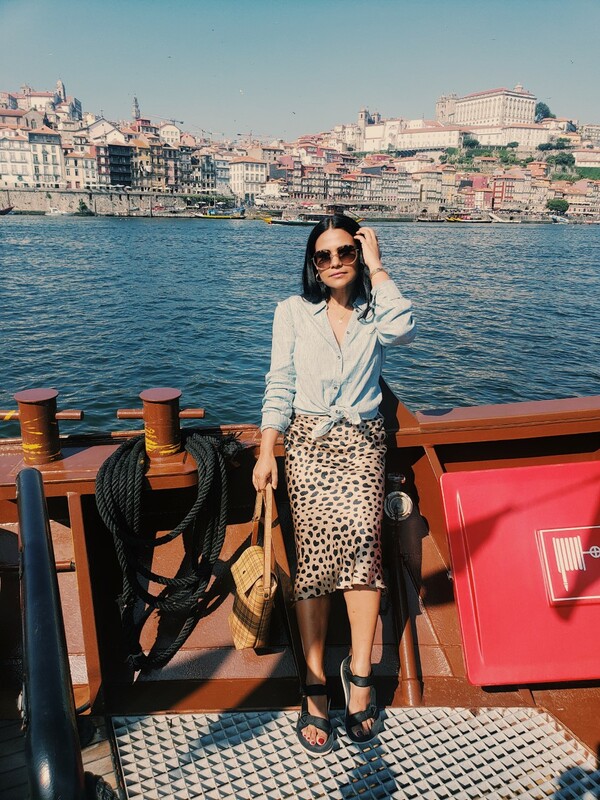 Another highlight of our time in Porto was taking the 12 Euro boat ride under five of the city’s bridges. The ride takes approximately 50 minutes and offers some scenic views of the city. We were fortunate and were able to grab a seat in the very front of the boat which made the experience even better! On our final day in Porto, we walked across the bridge to the “wine side.” There is where all of the wineries store their wine and have their tasting rooms. We chose to go to two wineries. The first was Ramos Pintos. There we tried five ports, the medium level range for 15 Euro. Our favorite was the last two of the flight, the 10 and 20 year old Tawnys. The most expensive, of course! But, we both thought that the 10 was actually our favorite. So, it was the best value of the two at 29 Euro a bottle vs. 68 Euro for the 20 year old. We then visited the Cockburn Winery. Strange name, yes, but good port wine! There we sampled a 2011 Vintage port and a 20 year old Tawny. Both were delicious! Of the two wineries, we both preferred Ramos Porto for the wine but the Cockburn Winery had the prettier tasting venue. For night life there is an area that has a lot of bars for the late goers, but with our jetlag, we were back in our hotel by 10pm. Of course, we then woke up at 2am so we certainly could have gone back out since we were then awake until 6am! Gosh, I hate jetlag and this time was bad! Two great vantage points of Porto can be seen from the entrance to the Se Cathedral terrace and on the other side of the Dom Luis looking back towards the whole of Porto. The bridge is an easy walk and offers some pretty incredible views. Then, for the adventurous and those not afraid of heights, once across the bridge take the cable cars down to the wine tasting areas for 3 Euro. The views on the ride are stunning as well! A major highlight was colorful tile found throughout the city on the walls of the buildings as well as some interiors such as the local train station. 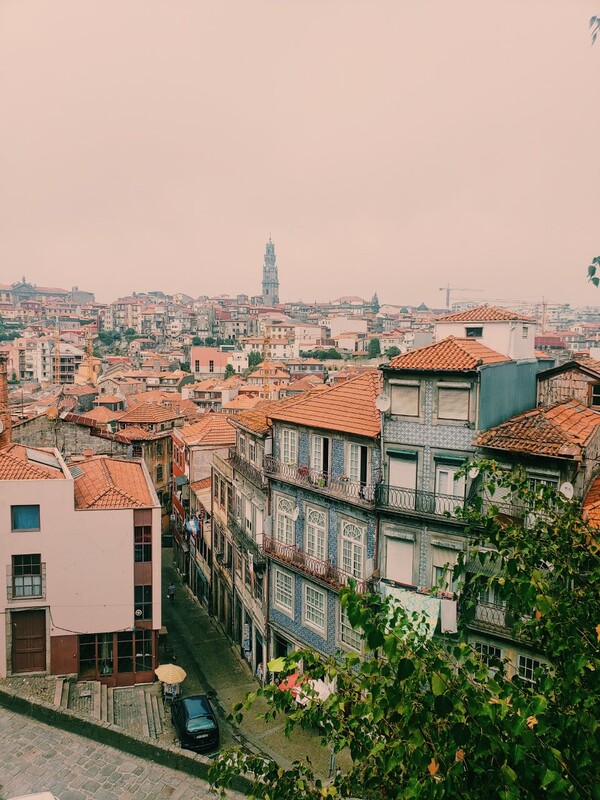 The bright tiles and architecture of Porto give the city so much character and charm that is it hard not to love this Portuguese city! Make sure to wear comfortable shoes (i.e. no heels) as you will be walking a lot and there are many cobblestone roads and sidewalks.